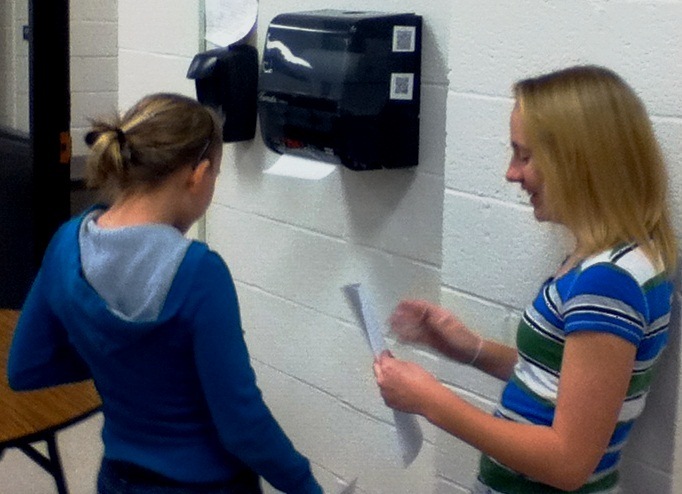 The students in two algebra classrooms at our Middle School recently had the chance to review for a quiz in a different way, by having a QR code scavenger hunt. The students and teachers all enjoyed this activity, which allowed us to have the students physically active while working on some difficult content. I used the snipping tool in Windows 7 to take a screenshot of each equation and saved each as its own image file. Images were each uploaded to the public folder in my Dropbox account. The link to each image in my Dropbox account was copied to the clipboard. The link was submitted to an online QR code generator. I used the site www.qrstuff.com to generate our codes. Each code was downloaded and inserted into a Word document. Six of the questions were presented in video form. 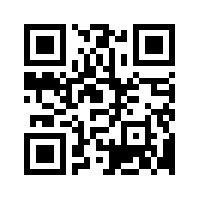 ( Some videos taken of us, others taken from YouTube ) The link to the video was used to generate the QR code. The document with all the codes was printed out. A PDF version of our document is available here . Once we had the codes printed out, they were cut out and hidden in 2 classrooms and the hallway. 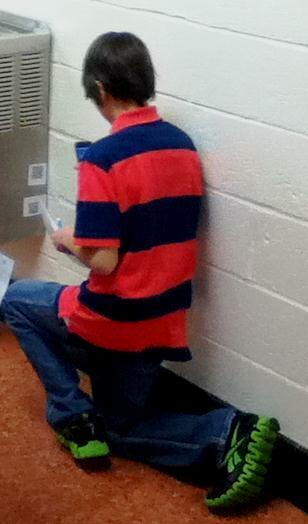 A set of 30 iPod touch devices were used by the students to scan the QR codes. I installed the app Scan on the iPods, since it is free and does not have ads popping up when viewing a web link. The students were grouped in pairs, with a few groups of three. Each group was given an iPod touch to share, but every student had to record their own answers on their paper. The students were shown how to access the app on the iPod Touch. Listed on the board was a breakdown of how many codes the students needed to find divided by locations : ( 8 codes in room 100, 8 codes in room 102, 5 codes in the hallway ). After going over the breakdown, the students were sent out to different starting locations to get them spread out. The students were very highly engaged during the activity. The 6 video questions allowed the students to see some real world applications of using scientific notation and exponents, which is always beneficial when learning any concept. The iPods were loud enough for the students to hear the video without having to use ear buds. As the students worked, they spent the majority of the time working on the review problems. Searching for the QR code for the next problem took a brief amount of time compared to actually solving the problem. The students were not staring at the iPod the entire class – they used it when needed and set it aside while working on their calculations (unless they used the calculator app to help with some of the problems ). The students did not have any difficulty with using the iPods – all of them were able to scan codes and play the linked videos without any problem. During our 72 minute class, the students only had enough time to solve about ½ of the problems. We had students check their own work with their group by scanning a QR code for the answer key, which we made available during the last 10 minutes of class. This allowed time for the teachers to circulate to each group and answer questions that the students had on certain problems. The students wanted to know when they would get to do this type of activity again, demonstrating how much they had enjoyed it. Both teachers were very happy with how the lesson had gone, especially since the lesson was so student centered. Mr. Elder and Mrs. Hoffman used the iPod’s a few days later for a lesson on graphing equations, which I will give more detail on in a future post. Thank you for the post. I’m working with my students on QR codes in Algebra 1 as well, and this was helpful to figure out how to display math notation by using Dropbox. I’m giving it a try for some review in the future!! Thanks and good luck. You can also upload your image files of the equations to Google Docs / Drive and make the images visible to all instead of using DropBox.